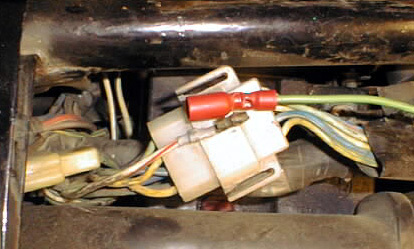 The 1982 Yamaha XJ1100J came equipped with a battery sensor system. Not all replacement batteries have the required sensor, however. Using one of these batteries will cause the battery indicator light in the control panel to indicate an error. 2000 ohm, 1/2 watt resistor, available at Radio Shack or other electronic parts shop. Radio shack price is about $.50 for a pack of 5 resistors. 2 feet of light or medium gauge wire, 14 gauge is fine. Male and female crimp-on bullet connectors and a crimping tool, soldering iron, or other tool to attach the connectors to wire. Get the connectors sized to fit the wire you will use. 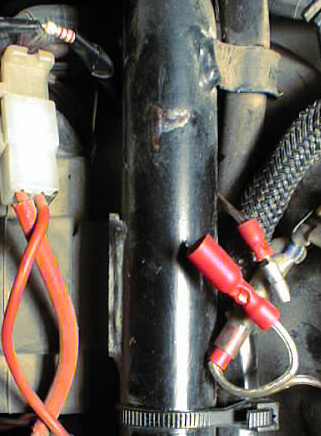 Heat shring tubing or electrical tape to insulate the connections. IntroductionThe aim of this modification is to fool the battery sensor system into believing the battery sensor is in place, when in fact, it is not. The procedure involves putting a resistor in-line between the battery sensor wire and a 12v power source. You will need to identify a power source. Some people have suggested running a wire from the "Accessory" fuse in the fuse block. I built a "Y" connector with short pieces of wire and bullet connectors, and used the tail light wire as a power source. This accomplishes 3 things: Power to the sensor system is turned on and off with the ignition key, it provides some fused protection in case of a short in the wiring, and it makes for a quick and clean installation. I also believe the tail light line is voltage regulated, which may be an advantage. 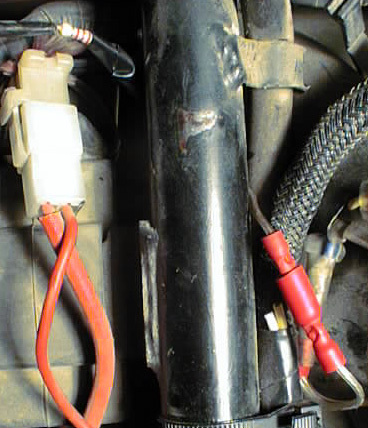 Begin by identifying the battery sensor wire. 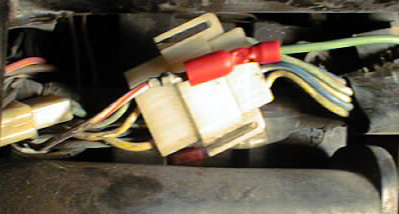 On my '82 Yamaha XJ, the battery sensor wire is white with a red stripe, and is near the main wiring harness connection under the seat. As you can see, it has a male connector. Green wire in this photo runs to one end of my resistor. It requires a female connector. Cut a length of wire long enough to reach between the battery sensor wire and your power source. Cut the wire into two pieces, and install the resistor. I soldered the resistor ends to the wire ends, then covered them with electrical tape for insulation. Heat shrink tubing would make a neater job, but use what you have. I made up a "Y" cable and used the tail light connection, located under the seat and just behind the battery, to supply the power to the resistor. Resistor wiring is run under the frame; note the resistor (with stripes) at top left of photo. If you follow the wiring, it comes out at the male bullet connector shown at the right side of the photo. Battery sensor wire plugged into resistor loop. Other end of resistor loop plugged into tail light wiring through "Y" cable. ConclusionThe process of adding the resistor should take less than 20 minutes, and will eliminate the irritant of either riding with the battery light on all the time, or having to hit the "Reset" switch on the XJ's control panel. In my case, the Reset did not turn off the light, but this modification did the trick. The outline of this process was posted to the XS 11 list from the Yamaha V-Max list. I have lost the original posting, but thank everyone involved for passing along the information.